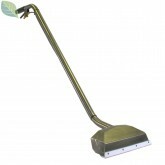 PMF's Mach 12 Titanium 2" Wand is the Carpet Cleaning wand that every other Wand is measured against. The 12" wide suction head and 2.0" down tube allow PMF's Mach 12 Titanium wand to generate a balance of excellent vacuum and great soil recovery, while keeping weight very low. Weighing in at just around 7 lbs, and as durable as all get-out, PMF's Mach 12 Titanium Wand is one of the lightest most effective carpet cleaning wands in the 12 inch x 2.0 inch size. In addition to the titanium, the entire Mach 12 Wand 2.0 series is made with the highest qualtiy components available to ensure years of trouble free and efficient service. 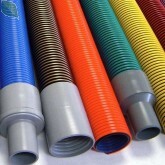 PMF even built the Mach 12 with flexible & ultra durable stainless steel solution lines! PMF's Mach 12 (2.0) has 4 spray jets that blast cleaning solution as the perfect angle, moving soils across carpet fibers, rather than pressing them deeper within. Soils are loosened and left in a perfect position to be immediately extracted by the optimally designed 12" wide suction slot. The Mach 12 (2" Tube) has a low profile head which slips right underneath low slung furniutre, eliminating the need to switch to a special tool. PMF's Mach 12 x 2.0 comes standard with Stainless Steel Glides but offers an upgrade to Teflon Glides, the ultimate in reduced friction and relief from back strain! The Mach 12's 2.0 inch Recovery Tube provides for maximum air-flow & soil recovery. 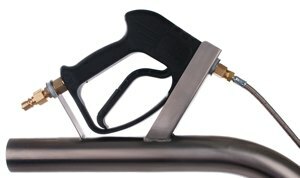 The perfect weight wand for high powered, truck-mounted steam extraction systems! If your looking for the most effective, most efficient, fastest cleaning, and easiest to use Carpet Cleaning Wand for Portable Carpet Cleaning Exractors, this is it! 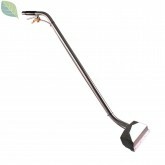 You've found it in PMF's Mach 12 Titanium Carpet Cleaning Wand with 2.0" diameter down-tube! Stainless Steel: This is the stock option that comes with the Mach 12 wand by default. It includes two Standard SS glides. One for each wand lip. Stainless Steel: This is the stock option that the PMF Mach Wand comes with by default. It includes two Standard SS glides. One for each wand lip. Teflon (w/Adapter): Choose this option if you did not choose 'Teflon Wand Glides' under the required 'Wand Glide Type' drop-down above since you will need the adapter to attach the teflon glide to your Mach 12 Titanium Wand. Includes two Teflon Glides. one for each wand lip, plus adapters. You can purchase in quantities of 1, 2 or 3 at time of Mach 12 Titnaium Wand Purchase.